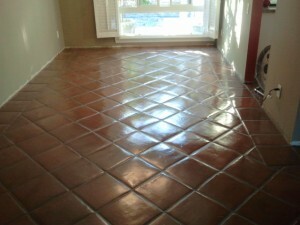 A good way to protect your floors no matter what kind of surface you have ceramic tile, paver, slate, marble, wood, linoleum whatever it is . You want to place magic sliders or felt pads underneath all table legs, chair legs and couch legs etc. If you have large rugs or runners you need to be very careful of the rubber mat on the floor because they will have a tendency to adhere to the finish, I’m not sure why the acids in the rubber and the acrylic in sealer, have a reaction. Once moisture gets in the mix the cloth mattes don’t do as much damage to the paver finish, but they don’t work as well as the rubber mats. So be careful in your decision. If you have house plants, its a great idea to keep them elevated with a water catch tray. This will keep the moisture off the floor and let the moisture dry out, this is really important on the exterior pavers, because of the constant watering, sprinklers, rain , water puddles under the plants and that when the damage occurs especially if this goes on for long term. You also want to keep dog and cat bowls elevated as well. Vacuums choose them wisely, because the plastic or metal wheels have a tendency to scratch the finish of the paver. Also they all don’t get the grout joints really well. The vacuums with the long hose and soft head brush are the best ones for the job, that’s what I personally use when I vacuum a paver floor. Last of all don’t over clean your pavers with overly strong cleaners and abrasive scouring pads follow the detailed instructions I give you of how to clean your floors and the proper cleaning products to use and they will stay looking perfect.